Songs of Eretz Poetry Review is pleased to present “Tattered” by John C. Mannone, Poet of the Week. One of Mr. Mannone’s poems will be featured every weekday during the week of January 18, 2015. Mr. Mannone’s biography may be found here: http://eretzsongs.blogspot.com/2015/01/poet-of-week-john-c-mannone.html. just start writing about something, anything. tattered blue wallet lying on the table. slipping through my fingers—barely a buck. framing her shiny black hair and soft gray eyes. of the tattered blue wallet I once lost. Lost. not the hurricane slamming trees into my shack. Poet’s Notes: In testing one way I have prescribed on how to defeat writer’s block, I followed my own advice. I say choose any object (in this case, a worn down blue cloth wallet laying on the dinner table at a restaurant) and start writing its description, without any expectation to create a poem. Simply write a sterile description. I submit that when one is focused on the task of writing such a description, the subconscious is free to make connections, which will emerge at some point in the writing. And that’s when the magic happens providing the genesis of a poem that you didn’t even expect to happen. “Tattered” evolved in this way. For this poem, the external setting provided a stimulus too. It was not the white noise (or clamor), but the fact that it was August, that I was writing on a shiny wooden table, and that the TV was blaring something in the background—the restaurant was a brewery and grille with many TVs. It turned out that these would be critical influences to tease the images from my memory. It was just five years earlier in a coffee shop sitting at a shiny wooden table with my wife when the Weather Channel showed hurricane Katrina just leaving Puerto Rico. It was “only” Category 3. But having studied the weather (which to me was exceedingly important since I was an active instrument rated pilot at the time), it was horrifyingly clear that the hurricane would strike the Gulf coast as a Category 5 storm. 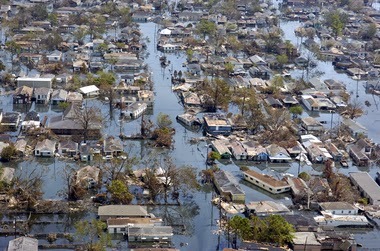 If I recall correctly, Katrina was demoted to Category 4 just before impact on New Orleans some three days later. I had scribbled the basic framework of the poem while my wife was in the lady’s room. Later, after some research, I modified the nationality of the narrator’s wife, Huong, whom he lost in the hurricane. I deliberately chose that name, because it also means “sweet fragrance,” an expression I use in the poem. But I use it also because of the assonance and the elegiac consonantal echoes with the repetition of “gone.” This poem has some political undercurrents too. There was very little discussion on the news about the Vietnamese community that had lost so much that day, too. Though this is a Katrina poem, it is much more than that. It’s a poem of loss. I wept as I made my prediction. And I still weep every time I read this poem. Editor’s Note: I hear echoes of Jack Kerouac and William Carlos Williams in this beautiful poem.